Re: Trimble Towers Workshop - Organisation. I've had a quick skim through this thread again but couldn't find the dimensions, can you remind me. 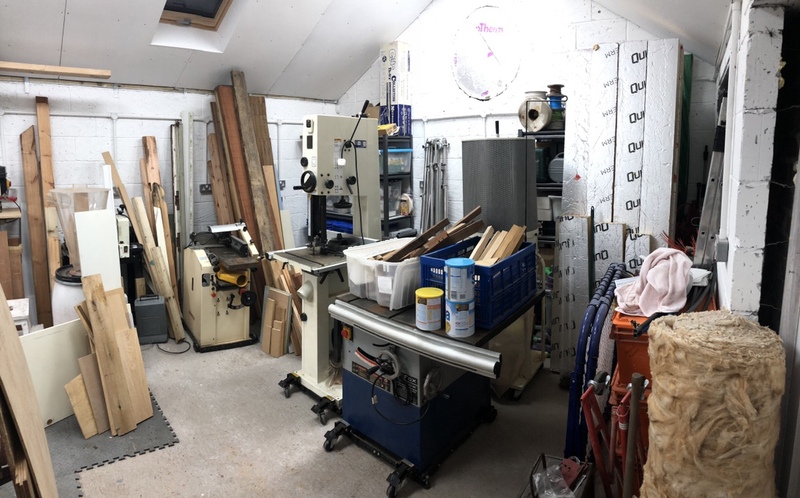 Although I really shouldn't even be entertaining the thought with the amount of work still to do on the house, I'm already mentally planning my new workshop, my current 6x3m is just too narrow. Dimensions are 8m * 5m with a 1m * 3m section out of the front wall. You can see the shape I'm talking about in the link below (scroll to the bottom of that page). With standard 4" cavity walls that gives an internal area of a midges whisker under 30m2, which is just below the requirement for Building Regs. As it happens I have done it to BR anyway because I want to be able to apply for change of use down the line, for if we ever come to sell, but there's no reason to if not required. 9fingers wrote: Those tins are great for storage. I have lots from when my son was a baby. He is nearly 32 now! 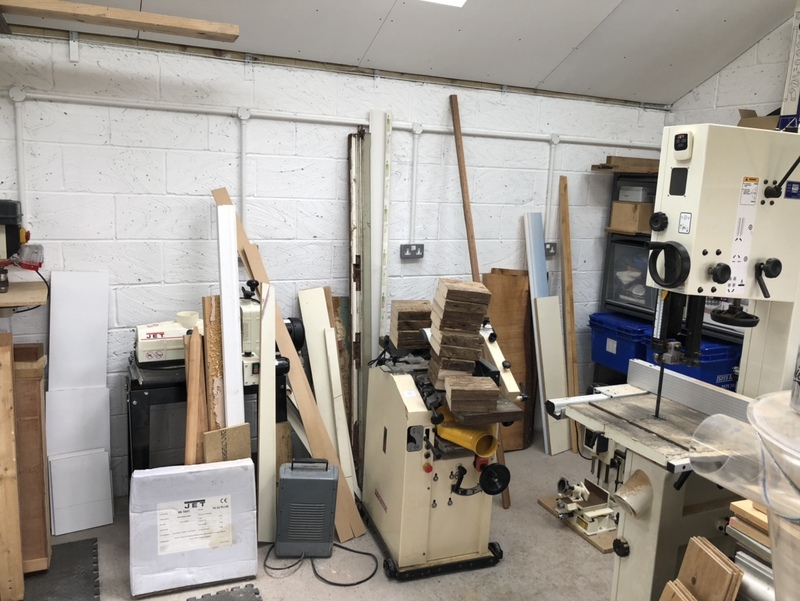 I think 4.5 - 5m is ideal, I note Mike's shop is 4.5m wide is also and having an additional 2 metres width to my 3m shop is what I had visualised to make my space useable. Mine would be right up against the boundary but made of brick and block so wouldn't need BR but I would have to apply for PP due to the proximity of the boundary. I’ve made my first sawdust!!! Does this count as woodwork...? If so then I’ve done my first woodworking in the workshop! Need to get the timber stash up into the Mez but want to properly sticker it so it has airflow all round. Used some gash pine I was going to make my gate out of before thinking better and buying sapele. Cut the lengths in two then into 3 lengths about 15mm square which should be more than sufficient do decently sticker it indoors. 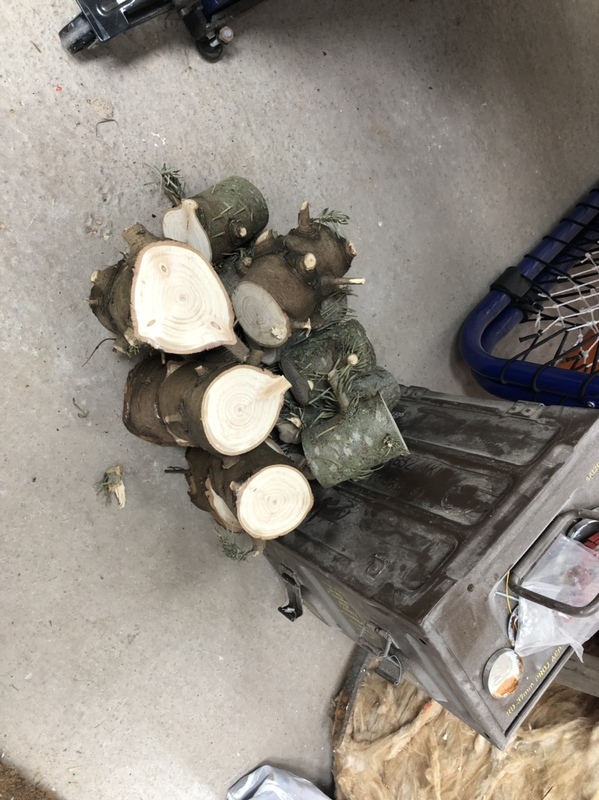 I also chopped up the leftover lengths of Christmas tree trunk to be used in the outdoor fire pit during the summer. Another hour in there yesterday between kids football in the morning then cinema to see ‘Shazam’! 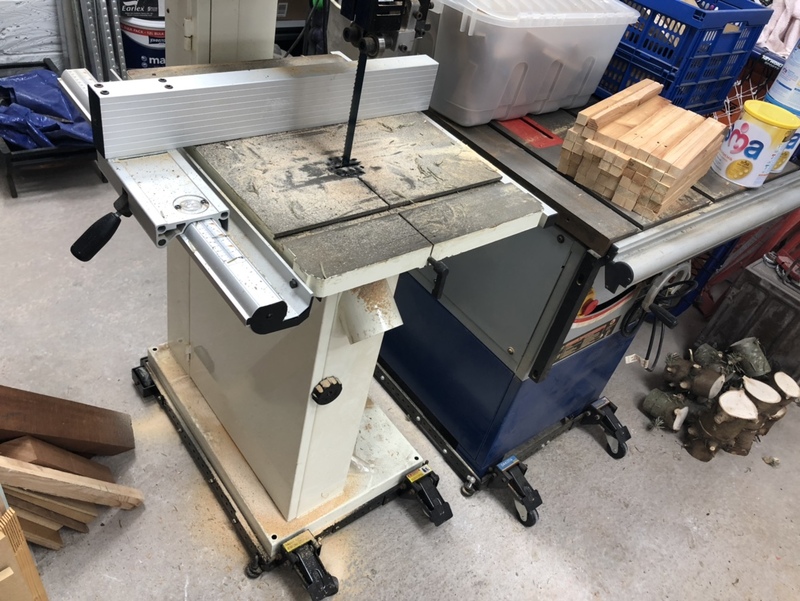 Managed to get the bulk of the timber up into the Mez and what’s left is the bits of sheet goods which I need to.m be ruthless with and decide which bits to keep and which to trash! Once they’re done though I will move the lathe and can get cracking on the bench/cupboard arrangement. Will you stick with those steps for access to the mezzanine? A conventional loft ladder would be bulky and eat into floor space but a rigid ladder which could be hooked onto that beam when required might be better. Andyp wrote: Will you stick with those steps for access to the mezzanine? 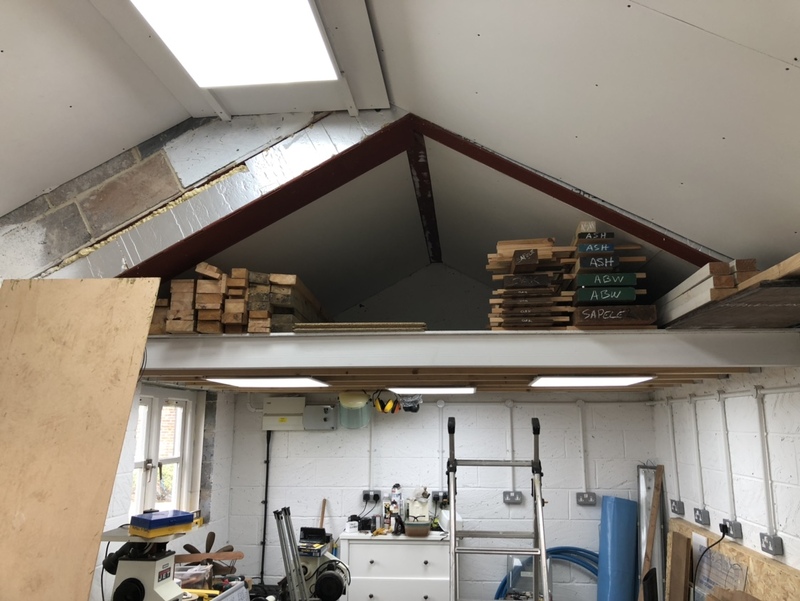 A conventional loft ladder would be bulky and eat into floor space but a rigid ladder which could be hooked onto that beam when required might be better. Good progress Mark are you making a new bench ? Doug wrote: Good progress Mark are you making a new bench ? Yep will build myself a proper bench at some point. That was a cheapie to get me going but it's crap! The spindle sander you mean? It's the standard one then I bought the large one when it was on offer on Ax at some point, 76mm one. I paid £54 but it is £82 now!!! Why do you ask? You're welcome to borrow the drum for a bit if you want to check it out?